When considering large-scale alterations to your home, demolishing to rebuild might not be your first consideration. However, it might make sense, both architecturally and financially, to knock down your old home and replace it with something new, designed to your specification. 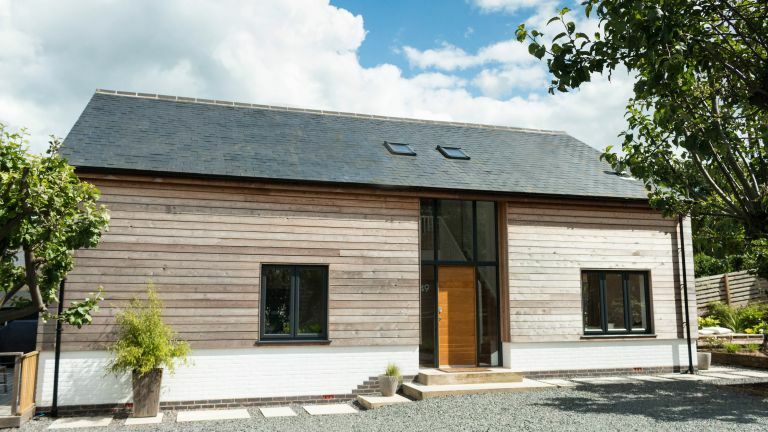 So, if you have taken on a renovation project that is gradually becoming more and more involved – think ever growing extensions, complete internal remodels and knocking down every other wall – this article is for you. Read on to find out when demolition and self build is the way to go. How much should rebuilding cost? The Homebuilding & Renovating Build Cost Calculator is a great tool for getting an estimate of self build costs, but you will be looking at around £1,000–£2,000/m2 for a good quality home of 200m2 (the size of the average four bed). To work out whether to renovate or rebuild, add up how much it would cost to build the house to the size and specification you want it to be. If this were to include a large extension or large-scale renovation, always speak to an architect first to consider the logistics before working out the costs. For extensive renovation works, check out our guide to costing your renovation project. Remember that when renovating, everything you do carries 20 per cent VAT, whereas to erase and replace means zero per cent VAT on almost everything. So, by rebuilding you will make savings on VAT and have the design freedom and simplicity of being able to create your dream home from scratch. You should, as part of your calculations, factor in demolition costs, what you paid for the original house and the potential end value of the finished project. With regards to demolition, this should cost between £15,000 to £25,000 for an average size building depending on the size of the existing dwelling (or £30–40/m3 but the cost can be affected by access issues or other complications like asbestos removal). Don’t be too hasty to discard what has been knocked down. Some of the building materials may be salvageable, such as bricks and roof tiles, especially if they have period detail. In this case, the worth of the salvageable items can be offset against demolition costs to decrease the price. Once you have made the decision to demolish, there are a number of things you need to consider before you reach for the wrecking ball. Hire an architect to help you with the design. Apply for planning permission to demolish and replace. Check if the building is of significant historical interest, locally listed. Check if the home is in a conservation area. If it is listed or in a special designated area, permission may not be granted unless you can prove why the replacement will be an improvement. In most cases you’ll receive a decision within eight weeks, although controversial schemes can take several months. As the land owner, you are liable for health and safety on the site, so speak to the Health and Safety Executive (HSE) to notify them of the demolition. ‘Classed as permitted development, in some cases you will not need to apply for planning permission to knock down a building, e.g. for smaller residential buildings of up to 50 cubic metres (measured externally, including the walls),’ explains Ian Rock. However, the local council may have removed or restricted these rights, and it’s essential to check. ‘There are draconian penalties for unlawful demolition, including the requirement to fully reinstate the original building at your own expense. Listed buildings are rigorously protected (listed building consent is only very rarely granted for demolition). Similarly, properties in Conservation Areas cannot be demolished without prior consent. ‘Before you unleash the wrecking ball, you also need to apply for a formal decision on whether the council planners want to approve the details of how you intend to carry out the demolition and restore the site afterwards. Knocking down an old house is a specialist job. ‘It’s also a legal minefield strewn with health and safety legislation, in most cases requiring prior notification to local authority building control,’ says Ian Rock. ‘There may also be potential risks from hazardous materials, such as asbestos, as well as possible issues with the support and protection of adjoining structures (hence the Party Wall Act may also come into play). ‘Where a building is demolished to make way for a new one, the new foundations can be cut through the old ones, provided there are no deep cellars,’ says Ian. ‘But new foundations usually need to be considerably deeper, so you can’t simply build on top of the existing ones. ‘A new suspended ground floor can bridge over any areas of backfill and rubble left below ground. At worst, large areas of backfill could mean using more expensive foundations, such as rafts. More worrying is the risk of potential contamination from former industrial use. Your new house design will need to comply with Part C of the building regulations, relating to site preparation and resistance to contaminants. The building control counter notice will also normally specify a range of precautionary measures regarding adjacent buildings. And don’t forget that your utilities will need to be capped off. Make sure you give a long lead time as utility companies can be slow in responding. You won’t need to notify the council, but a demolition company will need to know that it has been done and that it’s safe for work to start. Get planning permission for the new home ahead of demolishing the existing one. If you have planning approval before you demolish, you can ‘trade’ the existing volume, or size of the house already on the land, against your new plans. This is most important if you are in the green belt, as once the property's demolished, your land will have no volume and gaining planning consent from this point will be almost impossible. You may be able to gain extra volume on a site with a good design. For instance, if the existing dwelling has two floors with a separate single garage, you could build a double-height house across the width of both the former house and garage. Legally, you have to leave at least one metre between your dwelling and the boundary of your land to avoid a ‘terraced’ effect, but individual councils can have different requirements so it’s best to check with your local authority. You can also apply to have a basement floor level or rooms in the roof, to gain extra space within the existing volume of land calculated. If you appoint an architect at the beginning of the process, ideally before you buy the property, you can obtain advice on whether you will be able to achieve what you want to on the site. They can submit a pre-application to the planning department before you purchase. If you receive a negative response, you should think very carefully before going ahead and buying the building, to avoid heartache later on. A pre-application is not as detailed as full planning, but it gives a flavour of the new footprint and an agreement in principal that a new build would be permissible. Once you have purchased the property, you can work with your architect to submit a full planning application with a detailed layout. Be sensible with your application for a replacement dwelling, as the planning department is more likely to accept plans that are in keeping with the neighbourhood. For instance, if your street is full of Edwardian houses, you may be able to gain permission for a very contemporary house but you’ll have more of a battle than if you design something that has similar features to those surrounding it. However, if adjacent to a listed building, the contemporary approach will often be supported by conservation officers as they like architecture to stand alone in its relevant era, and not be pastiche. In some cases, particularly if you are within a conservation area, you may obtain planning permission, but with a restriction on types of building materials – such as roof tiles or bricks – which can be more costly. In this situation, your architect might need to be clever with the design to get the modern appearance you want. Before you set about erasing and replacing, check the land drainage, particularly if you are planning a larger dwelling than was there previously. In some cases, you may need a pump or holding tank. You should also consider who owns the utilities and whether you will also need new mains, as you might not be able to connect to the existing drainage system. If you have fallen into the unhappy position of purchasing a house, only to find you cannot get planning permission for the home of your dreams, you may either have to lower your expectations, or obtain designs for what will be permissible, sell the house with planning, and start the process again. Rebuilding your dream home is very achievable if you appoint the right design team at the beginning, but it isn’t as straightforward in most cases as people wish or perceive. However, it’s a great feeling when it does happen. Which features should your new home include? Eco features are also well worth incorporating. Underfloor heating costs more to install than radiators, but operates at lower temperatures meaning it is more energy efficient and cheaper to run. Thicker insulation exceeding the minimum requirements stipulated in Part L of the building regulations shouldn’t add much to your budget, since the non-material costs are already factored in. So, it makes sense to incorporate thicker, higher- performance insulation in your design. With the government currently in retreat over feed-in tariffs for renewables such as solar PV, the returns are diminishing. But since your roofers and electricians are already on site, installation costs are much reduced, so it may still be worth doing, reaping longer-term benefits. Melanie Clear is the founder and director of Clear Architects. With experience in both commercial and residential architecture, she believes great design takes careful thought, vision and a deep understanding of a building’s structure. Renovate or knock down and rebuild: which is more cost-effective?